Get ready for the Knicks next match-up against the Nets. Brooklyn is 2-4 and playing on the second night of a back-to-back. 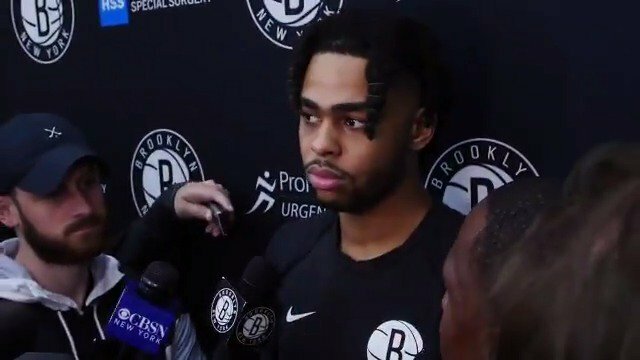 D’Angelo Russell thinks he complements Caris LeVert well. “I think we both are able to play off the ball. We’re both able to create. We just flow. We’ve got a chemistry that’s connecting well together,” Russell said. “I think the next step is getting other guys involved at the same time and finishing games.” They combined for 48 points and 13 assists against the Warriors on Sunday, and coach Kenny Atkinson said he likes their chemistry as well. Russell is heating up after a slow start with 23.3 points, 6.0 assists, 4.0 rebounds and 4.3 triples over his last three games. Allen Crabbe hit 4-of-11 shots and four 3-pointers for a season-high 14 points, five rebounds and two assists in Sunday’s loss to GSW. The rise of Caris LeVert and the strong play of Joe Harris might impact Crabbe’s usage going forward, but he does appear to be over his ankle injury. And this was a far cry from his 0-for-7 shooting night last Wednesday. D’Angelo Russell hit 9-of-14 shots and five 3-pointers for a season-high 25 points, six rebounds, six assists and a block in 30 minutes of Sunday’s loss to the Warriors. He got off to a slow start this season, but has rendered Spencer Dinwiddie somewhat useless of late, and has really turned it on over his last two games. He’s averaging 24.5 points, 5.5 rebounds, 5.0 assists and 5.5 3-pointers over his last two games, hitting 18-of-30 shots, good for 60 percent, and has also knocked down 11-of-17 3-pointers in his last two, good for 65 percent. Joe Harris hit 2-of-6 shots (all 3-point attempts) to finish with seven points, three rebounds, three assists and two turnovers in 30 minutes of Sunday’s loss to the Warriors. Harris entered the game at No. 4 in the league in 3-point percentage (59.3%), and hit his first two of the night. However, he missed his next four triples (and shots), but has still hit 15 of his last 23 shots from beyond the arc, good for 65 percent. He’s been a bit quiet in his last two games, scoring just seven points in each of them, but if you are looking for 3-pointers in your fantasy league, he’s probably available. "Coming back with a chip on our shoulder with that type of mentality going into Game 5...everyone knows it could be our last game if we don't come out ready to play."